What information is displayed in the activity stream, and who can see it? The activity stream displays all activity that takes place within the workspace based on the “visible to” permissions you set for entering various CRM data into the system. If you set CRM information to be visible to “only me”, then only you will see that information in your private stream. This includes contacts, tasks, opportunities, events, and notes as they are added. 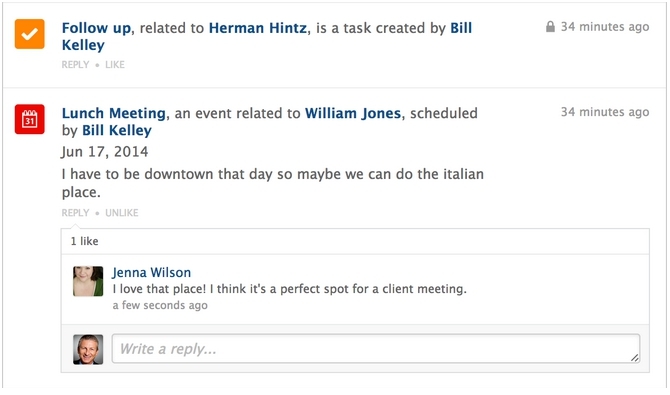 If you set visibility to “Everyone,” then all users have the ability to comment and “like” activity that appears in the stream for enhanced communication and collaboration.